Millennium 7 Publishing Co.: YOUR Social Media Listening Power? 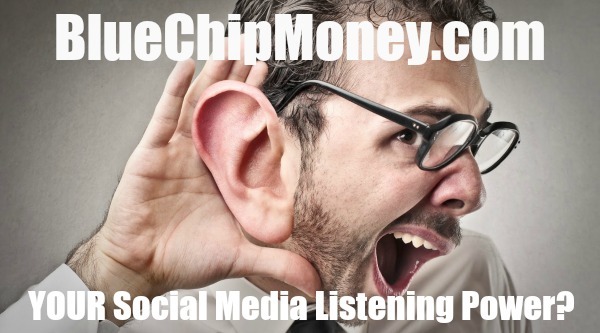 YOUR Social Media Listening Power? When you think about social media do you think about what your next post is going to do for your brand? How many new followers, likes, and shares you can garner? It seems social media these days is all about saying something. Sometimes it doesn’t matter if what you are saying is important or not, as long as it gets you noticed. But if that is all you are doing, you are missing the point. Recently Facebook founder Mark Zuckerberg changed the mission of the platform from making the world more open and connected, to giving people the power to build community and bring the world closer together. To do that you not only have to be present, but you have to communicate. Half of all communication is listening; some among us might say listening is even more important than talking. What if we looked at a credit union’s social media presence from that perspective? How many of you fear a negative comment, dread a sub-par review, have anxiety that someone will go rogue in the wee hours of the night? Don’t pretend these things can’t or won’t happen… listen for them and be prepared to address them. Related Article: Shut Up And Listen Social Media? If a tree falls in a forest and no one is around to hear it, does it make a sound? If someone complains about your credit union on Twitter but your credit union decided not to establish a Twitter profile, does that Tweet still exist? Just because you didn’t see the Tweet doesn’t mean the rest of the Twitterverse didn’t see it. The riskiest thing you can do is to choose to ignore a particular platform or social media all together. Be present and at least listen. You can’t please all the people all the time. And when that time comes, your gut instinct may be to delete that post. Don’t necessarily go with your gut. Sometimes deleting something negative can create even more negative posts. Unless the post contains information or content that would cause more harm, such as exposing nonpublic personal information or language that might open you up for regulatory review, take your time, work with your team–and within your strategic plan–to address the concern. In a study done by Bazaarvoice, 7 in 10 respondents indicated that when and how a business responds to posts impacts their perception of the level of care, support and the overall trustworthiness of the brand. In fact, studies show that consumers are more skeptical of businesses that have only positive reviews. our credit union’s Vendor Management Program covers many issues, but are you able to continually listen across social media, news sites, blogs, complaint sites, etc. for mentions of your vendors or partners? Due to the nature of vendor relationships in the financial industry, what happens with vendors and partners can heavily impact your business. Don’t be the last to find out. Technology can help you manage all your social listening. You don’t have to rely solely on Google alerts archived in your inbox. Today’s tools can scan social networks and the web for a wide variety of content and allow you to customize how you receive, manage and store your search results. We live in a world of information overload, but don’t let that information overwhelm you. Listen for everything – good and bad – and deal with each result strategically. If you do that, you will start to notice that you have more followers, likes and shares after all. Build that community instead of creating a one-sided platform where you are talking, but not listening. Guest Authored By Jeffrey Harper. Jeffrey is the President of BSG Financial Group. He brings more than 25 years of industry experience. ​He heads up the Sales and Marketing divisions of the company. Jeff plays a pivotal role in growing the company through innovation, marketing, compliance and customer support. Follow Jeff on Twitter.